What sets these smart displays apart from each other? 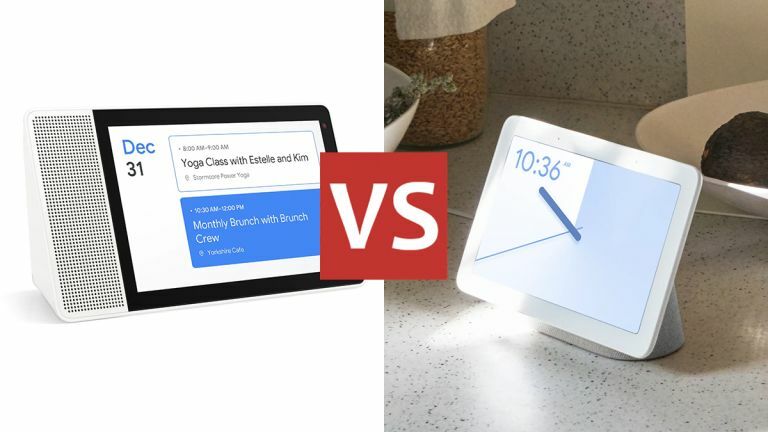 If you've decided that a smart display is the upgrade that you need right now, the Lenovo Smart Display and the Google Home Hub are likely to be somewhere near the top of your shortlist – but what are the main differences between these two smart display devices? Wonder no longer because we're about to lay out all the specs, features, and design choices you need to know about. Both the Lenovo Smart Display and the Google Home Hub rely on the Google Assistant, but you can find plenty to tell them apart as well. When it comes to a smart display, the screen is of course the most important component, but the Lenovo Smart Display and the Google Home Hub differ in just about every other design choice too. First of all the Google Home Hub goes for a compact 7-inch display, whereas the Lenovo Smart Display is available in either 8-inch or 10-inch versions – making it easier to watch video content, for example. The Lenovo Smart Display puts the speaker to the side and has an unusual curved backing, whereas the Google Home Hub sits its display centrally on top of the speaker. The Lenovo Smart Display is available in grey (8-inch) or bamboo (10-inch), while the Google Home Hub offers sand, aqua, chalk and charcoal colours. We like the design of both these speakers but you've got a definite choice between the more compact Google Home Hub and the extra screen real estate that you get with the Lenovo Smart Display. This is probably the easiest area to compare these two smart displays in because they're almost exactly the same: both the Lenovo Smart Display and the Google Home Hub are powered by Google Assistant. You may well have used the Google Assistant on a Google Home speaker or on your smartphone, but it's a breeze to use even for the complete beginner. Ask about the weather, or your schedule, or famous events from history... whatever you like. Having a smart display gives you the advantage of on-screen controls as well. Throw up a Spotify or YouTube playlist on the Lenovo Smart Display or the Google Home Hub, for example, and you can start and stop playback on the screen itself. You can also use Google Assistant on board these speakers to control compatible smart home kit – adjust the brightness of smart lights, see a video feed coming in from a Nest camera, and so on. Both the Lenovo Smart Display and the Google Home Hub double up as Chromecast devices, which gives you a whole host of additional options: you can cast content from any Chromecast-supporting app on your phone. Both these smart displays can be used to make video calls via Google Duo too, though there is a key difference – only the Lenovo Smart Display has an integrated camera, so if you're using the Google Home Hub, you can only be heard and not seen. That omission of a camera on the Google Home Hub is no doubt down to privacy concerns, but the Lenovo Smart Display does have physical switches for covering the camera and muting the microphone (so it can't listen in on what's happening in the room). The Google Home Hub has a physical microphone mute switch as well. Apart from the physical dimensions of the devices, and that camera, there's very little to choose between the Lenovo Smart Display and the Google Home Hub. They offer a very similar set of features, which makes it easier to choose between them. When it comes to putting two Google Assistant-powered smart displays up against each other, you're going to get a lot of overlap – from weather forecasts to YouTube videos, the software features are more or less identical. If you need a bigger screen and want more oomph from your audio, choose the Lenovo Smart Display. On the other hand, if you need something more subtle and discreet, opt for the Google Home Hub instead. Another reason to go for the Lenovo Smart Display is that built-in camera – it's the device to pick if you're wanting to make two-way video calls rather than just audio calls (note that it needs to be set up in portrait mode for this). Overall, the Lenovo Smart Display has more going for it, but that doesn't mean it's the right pick for everyone. It's more expensive than the Google Home Hub, so you might prefer the cheaper, smaller option.